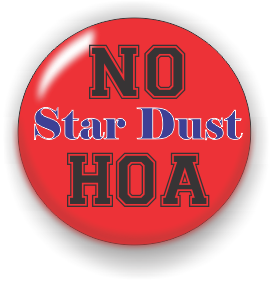 It seems the HOA board of duly elected citizens of Star Dust Hills, oh wait I don’t think the citizens of Star Dust Hills elected any of the board members. I believe they are a group of volunteers that are accepted by the other board members. I don’t believe they enforce any rules by sending a letter from the HOA attorney, and delivered by the HOA policeman, Oh I don’t think we have an attorney or policeman. When we lived in Danville we had a park, it had a pool and it was supported by tax dollars and you paid to let the kids play in the pool. I really don’t know what I am getting from paying $220.00 per year just for the honor of living here. Some HOA’s won’t let you hang a flag on the front of your house or paint the house green, with orange shutters, and red roof. I don’t know how many homes are under the control of Don Gedert but I’m sure he does not have to pay the $220.00 each for all of them. If there is 353 households in Star Dust and they pay the $220.00 dues that’s a total income of $77,660. I don’t know how much the water and lights cost, maybe $5,000.00 a year. That would leave enough money to pay someone to mow the HOA grounds and maintain the pool. Unless they pay the board members a salary each year. You could buy a new mower each year and still have money left. That don’t count renting the clubhouse and park for parties. My thoughts are to give the HOA over to the town government, they have an attorney and a police force. I am positive if a vote were taken 90 percent of the dues paying residents would vote to abolish the HOA and give the property to the town. That $220.00 would be a great savings for a lot of people in here, they already pay taxes to the town. I have a neighbor that wanted to put a porch on the front of his house but because the house was set on the build line there was no room to build because someone way back set up a constitution about where you can build on a property. But then we all know about a “first amendment” that means a rule can be changed if it makes it better for all the people in a sub-division.